Scientists detected a large number of chemical pollutants in freshly-laid eggs of hawksbill turtles along the Yucatán coast of Mexico. Due to their widespread use and capacity for long-range transport, a wide variety of chemicals are now ubiquitous in the marine environment worldwide. Chronic accumulation of chemical pollutants has been detected in all sea turtles across the world, with demonstrated links to health problems such as immune, endocrine, and reproductive disruption. Minimizing the exposure of sea turtles to chemical pollutants is of critical importance for their conservation and for maintaining ecosystem health. More than 90% of the chemical compounds targeted in the study were detected within freshly laid eggs. This included 25 organochlorine pesticides (OCPs) and 21 polychlorinated biphenyls (PCBs). These persistent pollutants accumulate over long periods and represent contamination acquired by sea turtles during their long oceanic migrations. Additionally, 21 polycyclic aromatic hydrocarbons (PAHs), chemicals that are mainly released to the marine environment as a result of the burning of fossil fuels and oil exploration and production, were also detected. Sea turtles can break down and secrete PAHs. Hence their presence in sea turtle eggs reflects recent, locally acquired contamination. The detection of such a wide range of pollutants is a cause for concern. It demonstrates that chemical pollutants can be transferred from female turtles to their offspring. Indeed, chemical pollutants such as PCBs, OCPs and PAHs can concentrate in fatty tissues and transfer from female sea turtles to the egg yolk of their offspring. Fats stored in the egg yolk provide a vital energy supply during egg development and during the “Lost Year,” the period between hatching and arrival of juveniles at their foraging grounds, in which migratory movements are vaguely known. Hence, transfer of pollutants from females to eggs can affect hatchling success and supply eggs with pollutants even before offspring come into contact with the environment. The study compared chemical pollution levels among three beaches in the Yucatán Peninsula. While great similarity in pollution profiles was detected for persistent pollutants (PCBs, OCPs), pollution by PAHs showed distinct differences between beaches. Differences in PAH profiles among beaches likely reflect their distance to areas with petroleum industry, which can be quite extensive in the Gulf of Mexico. Moreover, anticyclonic currents move water predominantly within the Gulf of Mexico itself, largely containing any pollutants released in seawater. By contrast, beaches that were more on the outside of the Gulf of Mexico were under the influence of different oceanic currents. Specifically, the Loop Current brings water from the Caribbean Northwards, thereby transporting pollutants from urban areas such as Cancún and Isla Mujeres. This was reflected in the turtle egg pollution profiles containing many PAH compounds originating from the burning of fossil fuels. The data on PAH pollution levels recorded in the study provide the first baseline for Mexico, which is highly valuable for risk assessment using hawksbill turtles as biomonitors. Due to their persistent nature, OCPs and PCBs have a capacity for long-term and long-distance dispersal by atmospheric movements and oceanic currents. Additionally, sea turtles themselves migrate over large distances and spend the majority of their adult life in distant foraging areas. This explains the similarity in profiles of these persistent pollutants among the three studied beaches. The persistence of these chemicals is highlighted in their continued presence in turtle eggs. For example, DDT pesticides were among the first persistent pollutants to be reduced in use and production in Mexico. Nonetheless, DDT and its metabolites were still reported in low concentrations in the present study. In fact, the specific mixture of DDT compounds observed in this study and other investigations on sea turtles around Mexico suggests a recent use of DDTs despite their ban. Likewise, a number of compounds listed as pesticides for which production and use should be eliminated according to the Stockholm Convention were among the most prevalent in the current study. For PCBs, a pattern unique to Mexico was detected in the study and similar investigations in the region. Specifically, low chlorinated compounds dominate PCB profiles along both sides of the Mexican coastline. For instance, low chlorinated PCBs were among the highest congeners in sea turtles of this study, the Baja California and Campeche. These strong regional patterns for Mexican turtles suggest their usefulness as pollution indicator species. 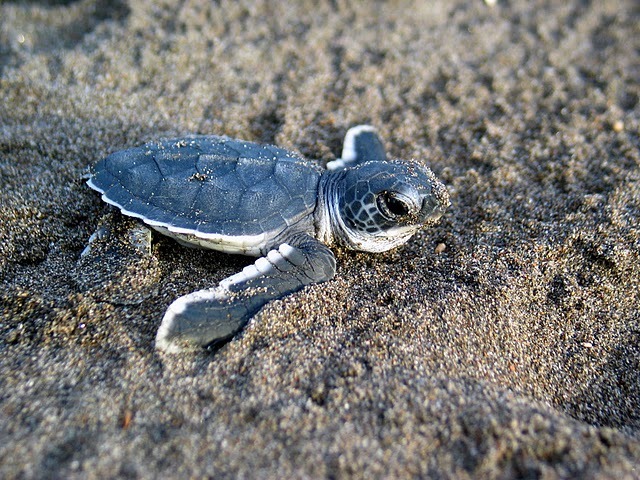 Additionally, the presence of low chlorinated PCB compounds in sediments of aquatic environments in coastal areas throughout Mexico, including Sonora, Sinaloa, Oaxaca and Veracruz states, suggests the use of a distinct mixture of PCBs in Mexico, whose effects needs to be considered for the conservation of sea turtles in this area. The outcomes of the study carry a strong message to policymakers and environmental managers. Indeed, conservation strategies and spatial planning for turtle nesting beaches in the context of chemical pollutants requires cooperation across geographical, political and national boundaries. Both the movement of the pollutants and the migration of the turtles make chemical pollution a large-scale issue that requires collaboration among all nations around the Gulf of Mexico. Albeit risk assessments for these pollutants are poorly developed for hawksbill turtles, the transfer of pollutants from females to their eggs and the varying profiles among nesting beaches could have implications for conservation success. Specifically, this study was conducted at one of their main nesting locations of hawksbills turtles in the world, making the outcomes of this study relevant to global conservation success of this species. Outcomes indicate that variability in chemical pollution among nesting beaches needs to be accounted for in spatial planning of protected areas, the implementation of conservation management strategies and the use of turtle eggs as monitoring tools for PAHs, OCPs, and PCBs. These findings are described in the article entitled Profiles of environmental contaminants in hawksbill turtle egg yolks reflect local to distant pollution sources among nesting beaches in the Yucatán Peninsula, Mexico, recently published in the journal Marine Environmental Research. This work was conducted by Cynthia C. Muñoz from Kochi University and Peter Vermeiren from EAWAG. Cynthia Munoz currently works at Cynthia does research in Marine Biology. Their most recent publication is 'Profiles of environmental contaminants in hawksbill turtle egg yolks reflect local to distant pollution sources among nesting beaches in the Yucatán Peninsula, Mexico'. Peter Vermeiren is a JSPS International Postdoctoral Fellow at Kochi University · Faculty of Agriculture and Marine Science.